Bring a little bit of restaurant quality to your creations with Olive Nation's gelatin sheets. Used widely in Europe, these thin sheets on gelatine are preferred over granulated gelatine because it dissolves easily and there is no chance of undisollved granules in your dish. Gelatin sheets can be substitutes for powdered gelatine in any recipe. Simply use one sheet for every quarter cup of liquid. This ingredient is also considered to be of higher quality than simple granulated gelatine and is rated by quality measurements like silver or gold. 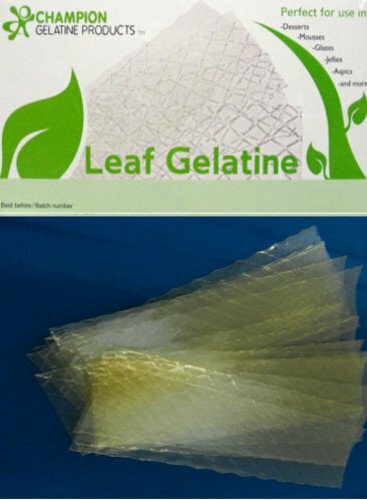 Olive nation carries a wide variety of gelatin sheets to meet your needs. Whether you need gelatine for a jello mold, thin sheets of gelatine to make window panes in your gingerbread house, or for jellies and other condiments, Olive Nation can provide the perfect solution. Shipped right to your door, these gelatin sheets are made ready to use by submerging in cold water. Note: It is important to know that gelatin sheets are not kosher or vegan friendly. Kelloggs Rice Krispies Toasted Cereals, 9 Ounce -- 16 per case. Kelloggs Froot Loops Sweetened Multi-Grain Cereal, 8.7 Ounce -- 12 per case.